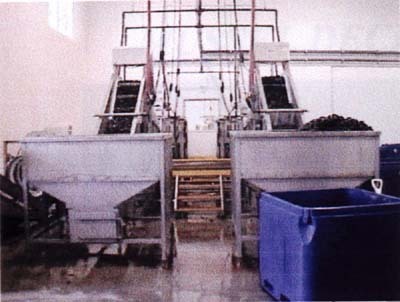 The manufacturing company that produces the "mussel processing lines" are Professional Engineers and Craftspeople that have extensive experience in the mussel processing industry. They will desifn, fabricate and install turn-key systems or individual pieces of equipment to suit your specific requirements. 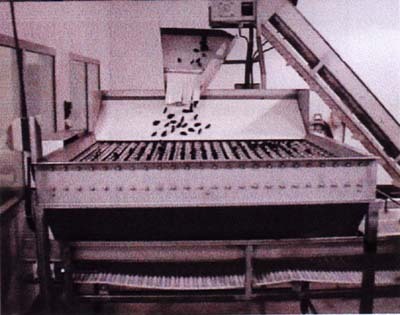 Item #1: hopper feed conveyor. Item #4: series 100 mussel debysser. Item #5: inspection pack conveyor. Item #4: series 200 mussel debysser. Item #4: series 300 mussel debysser. Item #1: oscillating sizer feed chute. Item #3: sizer discharge divided land conveyor. Item #4: spat declumper grader. To declump, grade, clean, debysse, and weigh mussels before packaging. 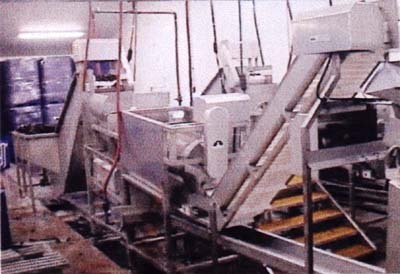 Mussels are placed into the hopper feed conveyor which are placed into the declumper/grader. From there they are placed onto the elevating conveyor and put through the mussel debysser. They then get passed onto the inspection conveyor and placed onto the weigh conveyor. This is a fully automated system. Equipment is designed to be gentle to your product throughout the entire process, resulting in mussels that are declumped, gradded cleaned, debyssed, sized and packed with minimal damage to the shell or stress to the mussel. Add on the Mussel Packaging Equipment to complete all your packaging requirements.